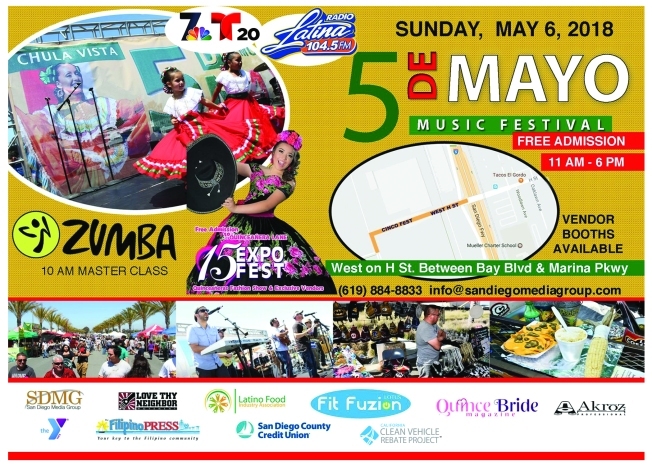 Chula Vista’s Cinco de Mayo Music Festival is an event that celebrates the history and diverse cultures of the people in San Diego, while bringing awareness and growth to the community. Enjoy more than 20 musical and cultural dance performances while enjoying delicious food, music and interactive zones designed for the entire family. The event also includes Pavilion Fun Zones Children’s Area, Art and Culture, Health and Fitness, Two Stages with live entertainment, Face Painters, Kids Shows, Mariachi, Danza Folklorico and a Quinceanera Expo. Location: Chula Vista’s own Marina and the City’s shopping district. Just exit off the H St. on interstate 5 or take the MTS Blue Line Trolley stop at H St.
For more information, please email us at info@sandiegomediagroup.com.